NRK announced on Wednesday, August 10th, that a-ha will be among the artists performing at a national memorial ceremony on August 21st, following the recent terror attacks here in Norway on July 22nd. “On 22 July, we, like everyone else in Norway and the rest of the world, were shaken to the soul by these actions of cruelty and violent provocation against everything we stand for. But we are also very proud to belong to a small country where people, politicians and the royal family worked together and showed solidarity in the face of such tragedy, and we are grateful to be asked to participate in the memorial ceremony. The band was asked by NRK on August 2nd if they would be willing to do a one-off performance at the memorial ceremony. “There was no doubt that they wanted to do it. 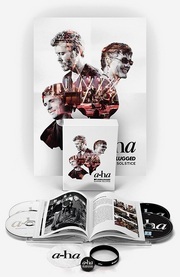 They are grateful to be able to contribute”, a-ha manager Harald Wiik told Dagbladet. The memorial ceremony is taking place at Oslo Spektrum and is only open for invited guests; survivors, family and friends of the victims, rescue workers and others. Government officials and members of the royal family will also be present. Besides a-ha, other artists scheduled to perform include Susanne Sundfør, Leif Ove Andsnes, Karpe Diem, Dumdum Boys, Sivert Høyem, Jarle Bernhoft, Bjørn Eidsvåg, Ingrid Olava, Sissel Kyrkjebø and Åge Aleksandersen. The 90-minute memorial ceremony, which starts at 3PM local time, will be broadcast live in Norway on the TV stations NRK1, NRK2, TV2, TV Norge, TV3 and online at NRK.no. It will also be broadcast live on the radio stations NRK P1, NRK P2, NRK P3 and Radio Norge. For more info, read the news story and NRK press release posted on a-ha.com. There is also an official site about the memorial ceremony (in English) at regjeringen.no.